Inspired by the work of still life specialist J.B. Monoyer, “Vase and raisins” tapestry is an ornate still life built around an elaborate urn. 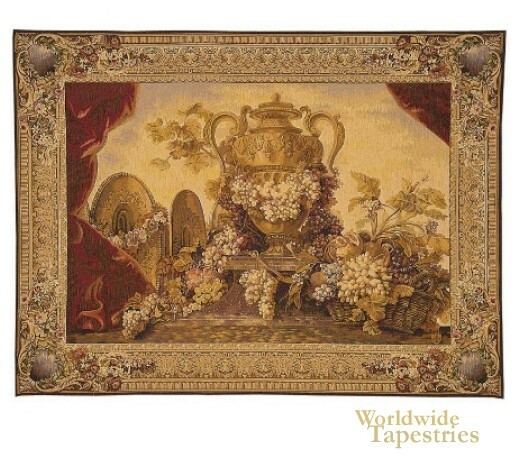 The original was woven in Beauvais in the mid 19th century, though the original painting dates back to the 17th century, which is on exhibit in Orsay in Paris. The monochromatic palette combined with the use of vivid spot colors makes “Vase and raisins” a real work of art. Placed upon a pedestal, the urn is entwined by a vine of grapes as well as white and blue flower buds. The hues evoke the feeling of a warm summer, while the detail captures both the eye and the imagination. It creates a calming effect that is enhanced by the richly detailed border. Vase and raisins tapestry is lined and has a tunnel for easy hanging. Note: tapestry rod and accessories, where pictured, are not included in the price. Dimensions: W 44" x H 32"